I’ve seen those dog harnesses for years. You know the ones. They look like what sled dogs wear. I’ve been meaning to get one for a long time, but never got around to it. Since my bicep and more importantly, my elbow, are still sore from Saturday’s 5K, I stopped at Walmart today to pick one up. The hype on the box says “Stops Pulling Instantly.” I’m cynical by nature, so I thought “Yeah right.” I expected Chocolate to keep pulling, perhaps not quite as strongly, since the force would be spread out over the area of the harness. I got home from work and started the process of getting the harness on the dog. 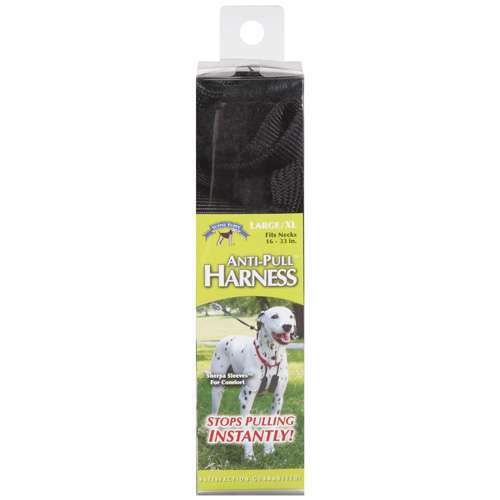 First you pull the harness over the dog’s head, then thread her front legs through the straps. Well, I got the harness over her head with no problem, but when I started trying to pull her legs through the straps, she thought it was some kind of game and starting rolling around on the ground, shaking her head, then jumped up and ran around the yard. By the time I caught her, she had managed to get the left leg hole around her right leg and the right leg hole was around one of her back legs. She was trussed up like a Christmas turkey and went crazy trying to disentangle herself. I was afraid she would hurt herself, so I took the whole thing off and started over. The second time worked much better. We got the harness on and we were off. Oh my god. It’s a dog-walking miracle. Chocolate always (and when I say always, I mean every. single. time.) gets out the garage door and takes off full-speed ahead down the driveway, dragging me along, because she is sooo excited to go. Today, we walked out the garage and she trotted briskly down the driveway, tail wagging like a metronome. You have to understand that this is a 50-pound dog who has been pulling me along for three years. I cannot express what a different experience today was. In the past, when we passed houses with dogs, she lurched in that direction. Today, she walked to that side of the road, but as soon as she got to the end of the lead, she stopped. In the past, if a car drove by, she would lunge toward it (she would love to be a car chaser; thank goodness I have a fenced-in yard). Today, I choked up the lead and she stood calmly by my side as a car passed. I seldom take her out of the neighborhood to walk, because it’s so difficult and I worry about what will happen. I tried running with her last year, but again, stayed in neighborhood. Our world just opened up. I envision lots of new walking routes, hiking trails, and running, oh the running. I can’t wait. Chocolate can’t either. This entry was posted in Reviews and tagged Dog, Exercise, Hiking, Running, Walking. Bookmark the permalink.